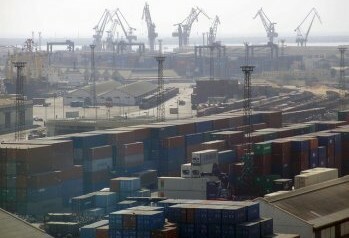 KARACHI : Four ships carrying chemical, soya bean meal, crude oil and containers are expected to arrive at the outer anchorage of Karachi Port on Tuesday, said a KPT source. OOCL Britan, Al Yarmouk, Mol Dignity, Rio Charleston, APL Brisbane and Dlace were berthed on Monday. While Du Juan Song, Royal Phoenix, Hammonia Gallicum, BBC Delaware, Oriental Protea, Fu Yu Bhan, APL Sharjah and Santa Rosa sailed out. Sky Marinver V, Jacksonville, Tug Jacksonville, Al Yarmouk, Rio Charleston, OOCL Britan and APL Brisbane were due to depart. Following ships are due to arrive on Tuesday: Karachi with crude oil, Lodestar Genesis with chemical, OOCL Jakarta with containers and Vinalines Mighty with soya bean meal.